Family members of two Gorkha representatives in the Constituent Assembly today slammed Bimal Gurung's statement that the duo were not dedicated enough to the cause of separate state, saying they were "ashamed" to say the Gorkha Janmukti Morcha president belonged to the Gurung community. Bimal Gurung had said in Kalimpong on March 30 that the Gorkhas wouldn't have been begging for a separate state today but for the mistakes made by Damber Singh Gurung and Ari Bahadur Gurung, the members of the Constituent Assembly at different times in the 1940s, . "I feel ashamed to call myself a Gurung. Had Ari Bahadur Gurung and Damber Singh Gurung dedicated something to this land for our sake, maybe, we wouldn't have been begging like this... I have to make up for the mistake they made. I have to rectify their mistake. Had they rectified themselves then, I wouldn't have to beg like this," Bimal had said. Damber Singh and Ari Bahadur were cousins. 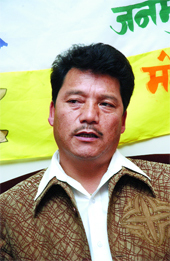 Today, their families issued a statement that slammed the Morcha leader's barb. "Bimal Gurung says he feels ashamed to be a GURUNG....on this point we do agree with him. We too feel ashamed that he is also a GURUNG !!" reads the statement issued by Udai Gurung, the son of Ari Bahadur, on behalf of the two families. The families said they are "shocked and deeply saddened" at the defamatory public speech given by Gurung. "The late Damber Singh Gurung and late Ari Bahadur Gurung were leaders of repute and revered by Gorkhas, not only in Kalimpong but all over India, As the member of the Drafting Committe (sic), Signatory of the Constitution and Member of the Constituent Assembly of India, late Ari Bahadur Gurung proved to the world that the Gorkhas of India could never be again labelled as immigrants or foreigners," said the statement. Apart from being members of the Constituent Assembly, both Damber Singh and Ari Bahadur were lawyers. Ari Bahadur became a member in place of Damber Singh, who died in 1948 when the Indian Constitution was still being drafted. Ari Bahadur was among the signatories to the Constitution when it was adopted on November 26, 1949. Damber Singh was also the founder of the ABGL and Ari Bahadur its member. "That the GTA Chief Executive, Bimal Gurung would on 30th March 2017 deride the achievements of the Gorkha leaders of such stature and lay the blame for his failure and non achievements at their doorsteps, speaks very poorly of him," the statement reads. Udai further said: "Does political compulsions force would be politicians to belittle the achievements of their leaders to raise their own status? We see this as their downfall !! It is neither right or justified and we, the Family of Late Damber Singh Gurung and late Ari Bahadur Gurung strongly condemn his statements." Bimal's outburst in Kalimpong has come as a surprise not just for the family members of Damber Singh and Ari Bahadur but also for his own party cadres who are worried about its fallout in the coming civic elections, particularly in Kalimpong. In fact, the GTA had two months back installed the bust of Ari Bahadur at Lal Kothi, its headquarters in Darjeeling, to recognise his contribution to the Gorkha community. The Morcha had also honoured him posthumously at an event to celebrate Constitution Day on November 26, 2015. "The confusion then arises in the mind of everyone, what was the purpose of the GTA honouring the life and achievement of late Barrister Ari Bahahur Gurung by installing his bust al Lal Kothi and felicitating this Family with such fanfare on 26th January 2017? What changed in these two months and warranted this outburst in Kalimpong, the home town of the two leaders?" asked Udai, who is a doctor. Morcha leaders in private admit that Gurung's statement was a big blunder. "The statement was something that was not discussed in the party and most party members feel that it was unwarranted at this point of time," said a Morcha leader who didn't want to be named.